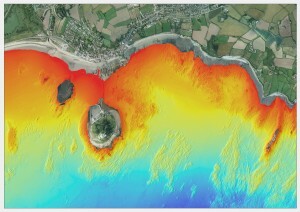 Since 2007 our Programme has been carrying out bathymetric, or seabed, surveys of the entire South West coast. Our surveys are important as they map the intertidal area, very close inshore, between the height of mean high water neaps and up to 1 km offshore. Relatively few stretches of the nearshore zone are monitored regularly by bathymetric survey. The main source of bathymetric data is often admiralty charts which, although regularly updated, provide minimal detail in shallow water. Shallow water has traditionally been left out of most bathymetric surveys as it is very difficult and time consuming to survey. This means that when you look at most seabed charts you'll see what is known as the 'white ribbon' - an empty white strip along the coast where no information is available. We set out to survey this area and chart the white ribbon around the South West coast, which we successfully achieved in the second phase of our Programme. We have used a combination of single-beam echosounder surveys and higher resolution multi-beam echosounder surveys to achieve this, working in partnership with the UKHO and Natural England on large sections of the coast. Quantification of changes and rates of change of dynamic sediments below low water. Production of detailed surveys for design and updating of models of nearshore wave climate and sediment transport. Identification of small submerged features which may affect sediment transport processes. Planning, design and construction of new works in the nearshore zone. Location and quantification of changes within offshore sediment sinks. Follow the link to the map viewer and data catalogue to download bathymetric data. An example of our multi-beam bathymetry around St. Michael's Mount, Cornwall.